If you’ve been following the steps in my previous ideabooks on starting your practice, you’ve navigated some difficult waters. Hopefully you now have work on your boards, or have a plan to get there. Perhaps you’ve made it through your first few projects. Either way, congratulations on taking charge of your business.Now is the time to think more critically about establishing your studio, your home away from (or within) your home. Your studio is, like everything else we’ve been discussing, an extension of your brand. 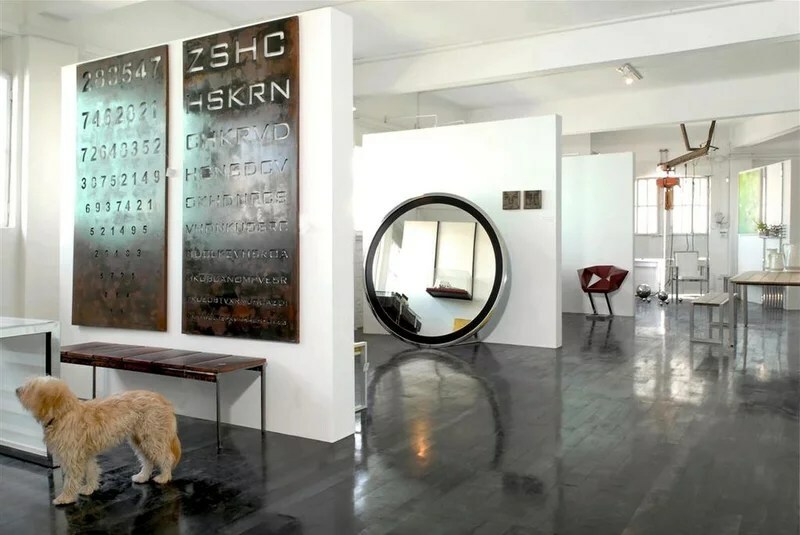 It starts with where you choose to practice, at home or in a rented office space, and extends down to every detail of what you choose to display in your workspace. Don’t let the lack of a fully outfitted, beautifully designed studio space be an excuse for not taking the necessary steps to open your own practice. Your first and most important task is finding the work. When you find the work, you’ll find a place to do the work. The studio space does not make the designer. LocationLike all new business owners, you’ll face the important decision of where you’re going to establish your practice — the actual physical location of the business. Managing the balance between cash flow, fixed expenses and your need to be seen as a professional in the broader world isn’t easy. For a bootstrapped business, it’s simply a question of economics. There are relatively few things you control when you set out on your own — your fixed expenses are key. 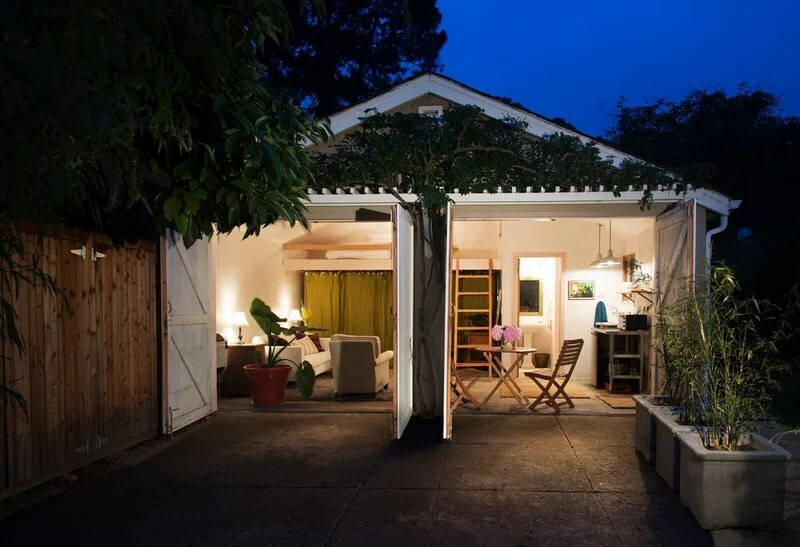 I advocate resisting the urge to rent (or build) the perfect studio space. Your low overhead is one of your greatest advantages as a new, sole practitioner and business owner. If you spend (or worse, borrow) money to get into new digs, you’ll leave your new practice cash starved and in debt. That drag has the potential to sink your business before you’ve had a chance to grow it. Besides, it just isn’t necessary. Strive to be a debt-free business and keep your expenses to a minimum, and you’ll enjoy profitability faster than you thought possible. Saddling yourself with a monthly rent payment for office space will only increase the pressure you’ll feel to accept work that may not be a good fit, or you’ll focus too much on receivables early on. The decision to work from home shouldn’t be taken lightly, but as with other steps, consider it an intermediate decision that you’ll reevaluate as your business grows. For many newly minted firms, choosing to work from home isn’t a choice — it’s a requirement. With more and more of the world’s workforce adopting alternative working arrangements, working from home doesn’t have the stigma it once had. Check your local regulations to be sure you’re allowed to conduct business from your home. If you’re a sole proprietor, this usually isn’t a problem, but when you have employees, you may come up against some resistance (and rules) restricting the use of your home for business. There are some advantages and disadvantages to consider. Low overhead. This is a competitive advantage for securing clients. Lower fixed expenses allow you to charge a lower fee while remaining profitable. Tax benefits. You’ll benefit from the home office deduction and mileage deductions for travel from your doorstep. Corporations can shift wages to rent to reap employment tax savings. No commute. More time dedicated to your work, lower personal expense, and better for the planet. Branded space. You control the client experience. Flexible hours. You can fit work in between odd hours and adapt to your ever-changing life. This can add up to more total hours spent in the business, because it’s an efficient way to get work completed. Convenience and comfort. This can go both ways. 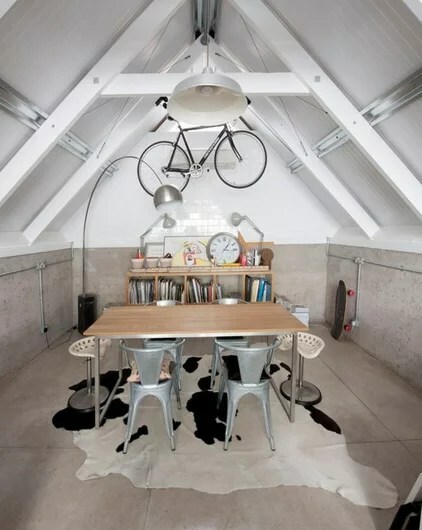 You may get a lot of work done in the comfort of your own surroundings. Or you may mentally connect your home first and foremost with relaxation and escape. Sometimes mixing the two is difficult. No work-home separation. This can translate to more time working than you would have if you left work behind in a separate office at the end of the day. It can be hard to resist the draw of an incomplete project or a design you’re particularly passionate about staring at you from your corner office. Isolation. Working from home alone can be creatively isolating and lonely. You’ll need to reach out to others both online and in the real world for critiques, conversation and new ideas. Assume it’s part of your job. Distractions. The laundry is stacking up, the dog needs walking, there are dishes to do and your kids want to play — your home is full of distracting tasks not related to work. Space constraints and overlap. You may not have enough room in your apartment or home for a separate office, which will require that some spaces multitask. Try to disassociate work and relaxation environments (for example, don’t work in bed or on your LC4 chaise). Lack of a public face to the business. Location is king. If others in your area have a highly visible office space, your lack of a sign on Main Street can render your business less legitimate in the eyes of some. It also means a higher marketing expense to make up for the lack of exposure. You’ll have to weigh these upsides and downsides and work consciously to overcome the disadvantages. However, as you’re a home professional, your house is uniquely positioned to serve as a business card for the work you do.Leverage it. Creative professionals don’t need to rely on standard brick and mortar business accoutrements. Creatively adapt your surroundings to tell your personal story. Sell the fact that you’re a legitimate business to your clients in other meaningful ways. There are some businesses that really do benefit from Main Street exposure and actually require it to scale. 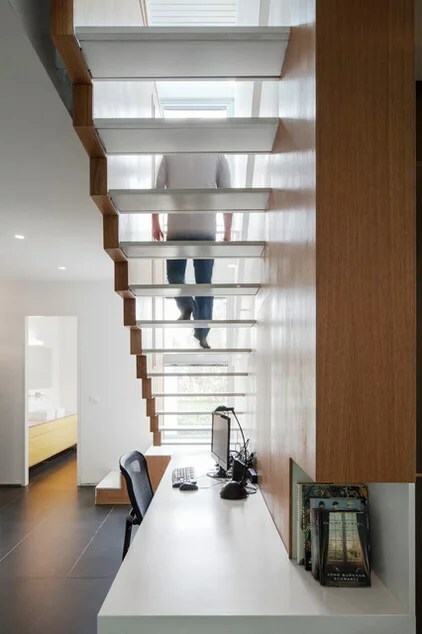 If you’re one of those businesses, make sure your plan involves a bridge to move from your initial home office as it grows. 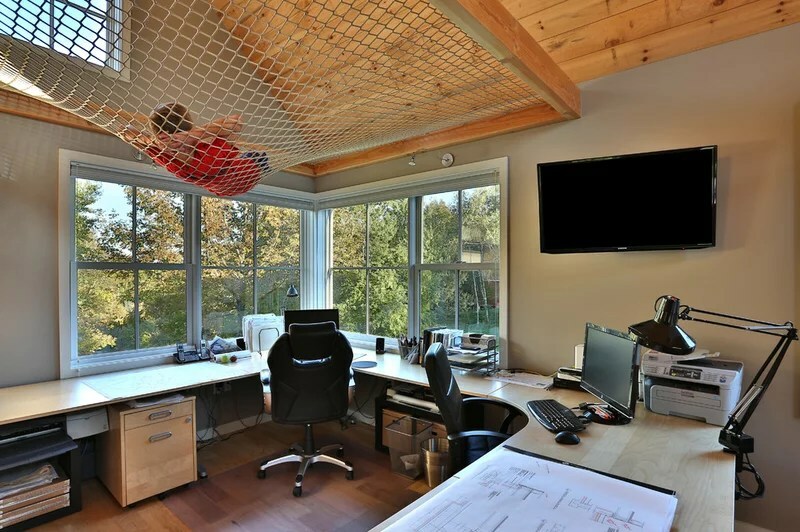 A Dedicated SpaceIf you do choose to work from home, know that you’re not alone. Many professionals have made this choice, including the great Finnish architect Alvar Aalto. That being said, you should do your best to craft an environment dedicated to your professional work. If at all possible, it should be a separate place you can go to and a place you can walk away from. If you work from your couch or dining table, these are places you’ve already mentally established as places for doing certain tasks. The dining table is for reconnecting with family around a meal; the living room couch is for relaxing. These are powerful connections in the subconscious mind. Creating a space and a routine that are uniquely suited to your professional endeavor is the foundation for high-quality, legitimate and productive work. Your clients deserve this level of dedication and commitment. The government cares too about your selecting a distinct space in which to practice your profession. If you’re planning to take advantage of the tax benefits of the home office deduction, you should be familiar with and in compliance with all of the IRS regulations. 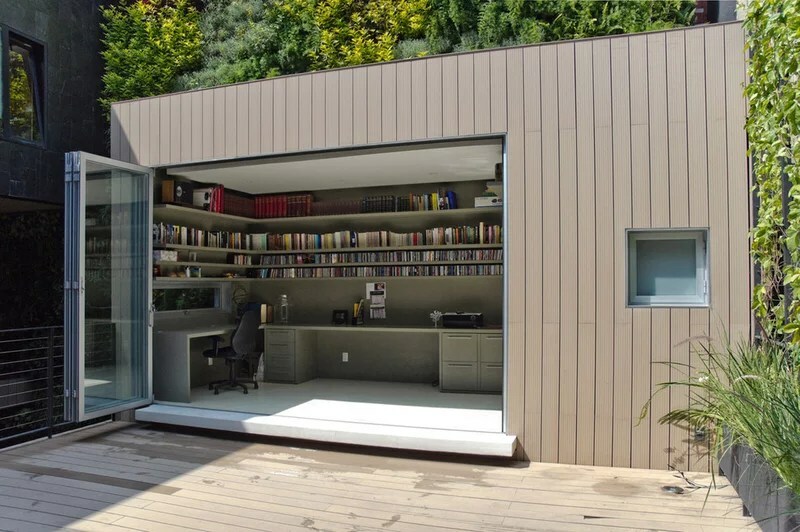 Your home office must be your principal place of business and a place where you regularly meet with clients. 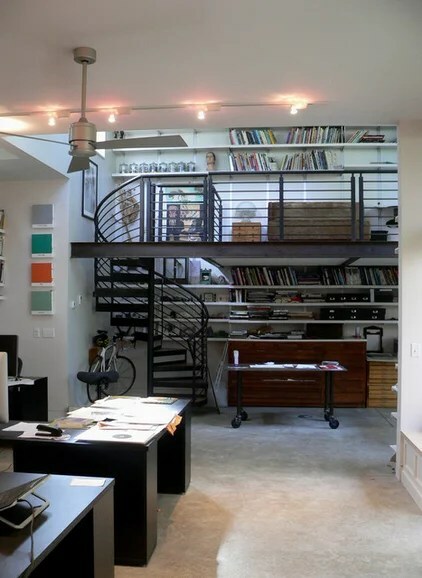 Your home office square footage must be distinct and dedicated to your business. If you use your dining table for both dining and business meetings, that space can’t be counted toward the square footage of your home office. Distinct office space will allow you to easily calculate the percentage of your home that’s used for business and in turn the amount of the home’s expenses (Internet, heat, plowing, utilities, taxes etc.) that can be assigned to the business for tax purposes. 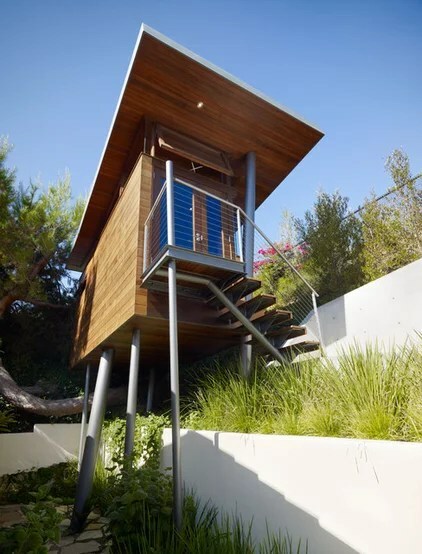 Separate StructuresConstructing or repurposing an outbuilding on your property has some advantages. Privacy. Even a small physical separation creates distance between your personal and professional life. It’s important for both you and your family to define a boundary, a threshold for work. Your clients, as close as they’ll probably become to you professionally, are welcomed into a separate professional space. This reinforces the value proposition while maintaining a professional distance — you’re inviting a client into your business, not your home. It’s important. Having the inevitable uncomfortable client interaction in your personal space can have unintended effects that reach beyond a stressful meeting. It can be hard to fight the perceived awkwardness and sense that the confrontation is more personal than it is when it happens in your personal refuge. Mental preparation. The few steps that it takes to “commute” to your office actually prepare you mentally for the routine of doing your work. It’s sort of like the practice of doing the dishes before sitting down to work. It focuses you on the tasks ahead. Convenience. 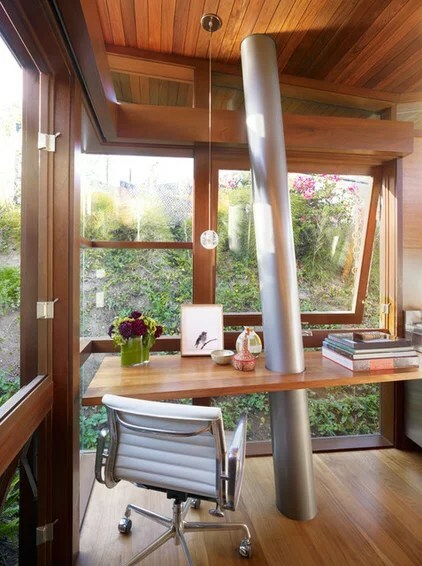 If your home doubles as your office, you’ll be required to maintain an utterly tidy outward appearance at all times. It’s is up to your personal habits how easy or realistic that is, but with a house full of kids and pets and life’s clutter, it can be an unreasonable expectation. A separate studio space means you’ll be responsible for controlling the mess. One person’s professional clutter (in theory) is much easier to keep tidy than multitudes. Taxes. You’ll be able to neatly subdivide all of the expenses for the structure for tax purposes. If you’re a corporation, you can shift wage expenses to rent, saving the employment tax. Studio EssentialsWhether you work from home or rent an office space, you’ll of course need a set of basic tools and items to do the work. A place where you can plug in your laptop, a place where you can sketch, brew a pot of coffee, hold your meetings and do your design work. Furniture. 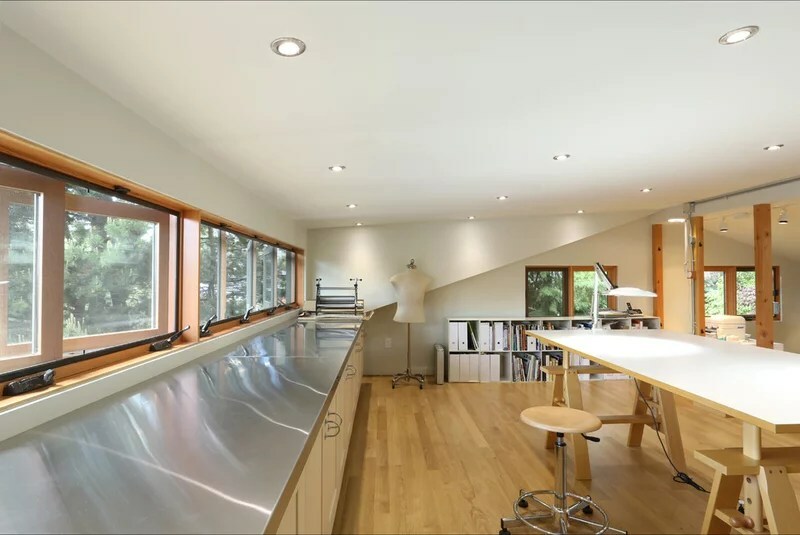 Whether it’s an old drafting table or two sawhorses supporting a solid core door, you’ll need a worktable and a seat — for your clients too. A bookcase or two for your reference library and some material samples would be useful too, but are certainly not required. While most of our work is done digitally, we still have the need to print drawings for presentations, for coordination, for as-builts and to quickly answer field questions. Having a dedicated space to spread them out on won’t be necessary until you have a few projects under your belt, but know that the need is coming. Phone. Preferably a smart phone. Granted, they’re expensive gadgets, and this probably doesn’t fit with the lean start-up model, but their power is hard to overstate. Pair it with the right apps for taking notes and photographs, handling email, browsing the web, texting — they’re indispensable. Oh, and it’s a phone too. Your lean self may survive with Skype via your Internet connection, but at the very least you should default to an inexpensive, dedicated office land line. Internet connection. This is your link to a broader world and your gateway to marketing your services. It’s one of the most powerful tools you’ll use. Bundle phone service with your Internet connection if possible to streamline costs. All-in-one scanner, fax machine and printer. I don’t think these combination machines are particularly necessary for someone just starting out. But I’m sure there are pros out there who would say otherwise. Having a dedicated flatbed scanner is great for incorporating rough sketches into presentations, but it’s not essential right up front, especially if you have a smart phone. I have a dedicated scanner in my studio, yet I continue to use my phone for most of my scanning needs. I don’t personally have use for a fax machine, and all of my printing is done via my plotter, which has the ability to print documents that are letter size through sheets 150 feet in length and 24 inches wide. If you can’t repurpose a printer you already have and your business requires any or all of these to function at a basic level, you’ll need to plan accordingly. Computer hardware. Repurposing an existing home computer or laptop aligns with our lean start-up model. If this isn’t possible, I recommend purchasing a good basic laptop. They’re versatile and portable and serve many different needs, from light office work to presentations to processor-intensive 3D modeling tasks.Tablets are extremely adaptable tools that can convey concepts, house your portfolio and organize your office life, calendar, email etc. If your household has one already, put it to work in those roles for your business. Software. Specialized drafting and presentation software is expensive and requires careful consideration. This is a category unto itself, which we’ll discuss in a future ideabook. Printer or plotter. Printers are very affordable now. Make sure you pay close attention to the cost of consumables before purchasing. A plotter certainly isn’t a necessity when you’re first starting out, but sooner or later you’ll decide that life is just easier with one. I purchased my plotter out of necessity after securing my first large commission. Starting out, it’s not hard to go paperless for presentations, and all of your reprography needs can be outsourced to print shops and drop-shipped to the client or contractor. Consumables. Trace, pens, pencils, folders, paper, markers, chipboard — you know best what supplies you need to get work done efficiently. Now you’ll think of them as expenses. Be sure to track all of these purchases for tax purposes. You can depreciate the equipment purchases over a period of years or depreciate them all at once in a single year. Talk with your accountant about the best strategy for your business. Meeting space. Depending on the needs of your individual practice, you may require more or less dedicated meeting space for clients or consultants. You should have a plan in place to address the need.If most of your work is interior design or renovation work, many of your meetings can take place at your clients’ homes. New construction can be trickier, because undeveloped land isn’t usually conducive to productive meetings. For those situations you’ll need an alternate plan. If your home isn’t suitable to handle those meetings or you’re not comfortable using it, sleuth out a local spot in which to conduct those engagements. Another possibility is to seek out a shared meeting space or coworking space. Having every meeting in a coffee shop can be impractical. Understand that many clients want to see where you work. It connects them to the design and production process — and can be a sell for a premium fee. Be very cognizant of this if your home doubles as your studio. Your brand must shine through when clients visit. 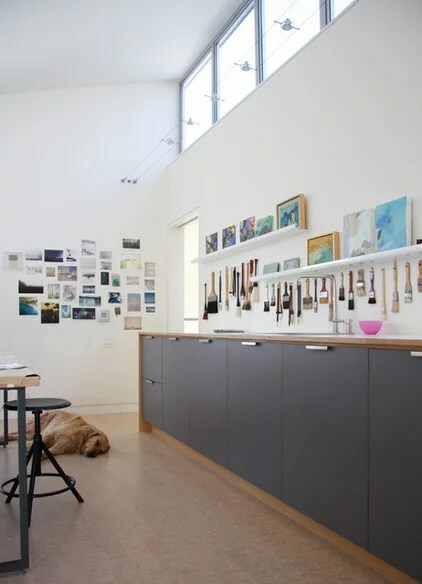 People have a certain tolerance for the messiness of design, so a cluttered studio or the workshop of a furniture maker or cabinetmaker can have a certain appeal. Seeing work in progress is interesting and provokes conversation about new ideas and directions for current work. If your workbench, dining table or drafting table can double as a conference venue, excellent. If not, have a plan in place. Reference library. I still have a nostalgic place in my heart for physical books. But they do take up a lot of precious real estate. I’ve found clients actually looking at my book collection and ask what I’m reading and by extension thinking about. This can say a lot about you.In terms of space for physical reference materials, I personally dedicate very little space to this. Code books, graphic standards, manufacturers’ product literature, it’s all updated at a pace I can’t keep up with. When I need it, I search online for the most accurate up-to-date information. This negates the need to maintain a dry set of standard reference books. There are certain physical catalogs that I just find easier to use than the online versions — window and door catalogs, for instance — so I maintain a rolling shelf unit with them for quick access and swap them when they become outdated. 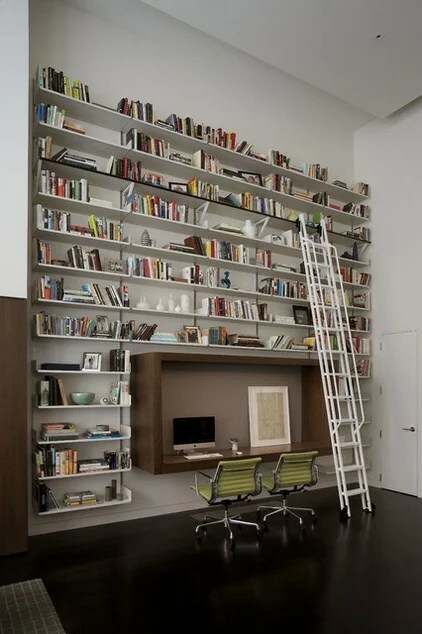 Populate your reference library with the books that inspire you. Include material on subjects other than just architecture, such as books on artists, graphic designers, filmmakers or typography; biographies; novels; and short stories — it will all speak to who you are as a whole designer. Samples. I can never seem to make enough room for material samples in my library. They take up more room than my physical book collection. For me they offer inspiration, and they speak to who I am as an architect. I’m driven by the process that turns these raw materials into a home. I love how they can speak about a client or a site. It’s part of the magic of architecture for me. There’s no substitute for handing a sample of a piece of concrete, stone or wood to a client to touch and see and sense.Samples are heavy, so a more heavy-duty means of cataloging them is necessary. This can be in the form of rolling steel carts, industrial supply shelving or filing drawers. It’s helpful if the samples are nearby for your design meetings. Your sample library may be more or less important. Surround yourself with the things that inspire your work and make sure your clients are able to see that inspiration. It will connect them to you and your process — the person they’ve hired to do the work. All of these studio essentials will make doing the work easier. But honestly, relatively few of them are actually required. When you’re motivated by the will to make it work, you’ll be surprised by just how resourceful you are in finding a place to get it done.This brings us back around to our discussions about branding. Decide what it is that makes your practice different, special and unique, and build your studio around that. We all have a vision of what our ideal studio looks like, but it takes time (and profitable projects) to build it, both physically and metaphorically. Design your practice to reference your mission statement and build your brand consistently through the projects and clients you work with, and over time your studio will evolve to look like that vision. It’s inevitable.